Want to camp but shaky on skills? There’s a cure for that. For some people, camping seems as easy as tying your shoes. For those of us who didn’t grow up pounding tent stakes and cooking over a campfire … well, it can be more than a little intimidating. My choices were to avoid camping for the rest of my life or to dive right in and give it a try. I gathered up my courage and decided I can do this! Then, I realized I hadn’t a clue where to begin. As a member of the computer-savvy generation, I did what any of my friends would do: surf the Web. There I found a dizzying array of tents and other gear in all kinds of shapes, colors, sizes and brands. I was overwhelmed and immediately defeated. Luckily, my job at the Texas Parks and Wildlife Department provided just the answer. 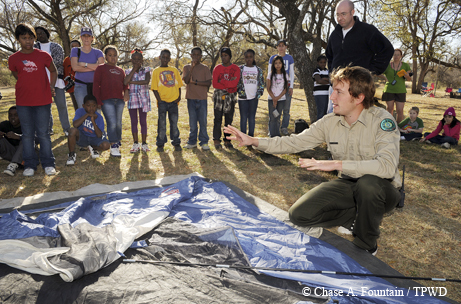 The low-cost Texas Outdoor Family program, offered to all Texans by TPWD, not only teaches “newbies” like me how to camp, but equipment is provided. 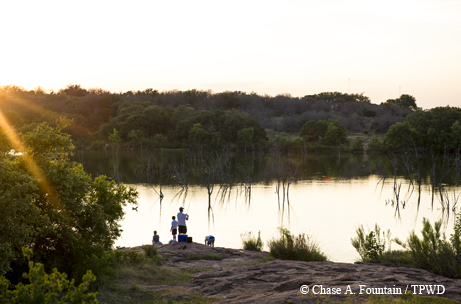 Inks Lake State Park hosted a Texas Outdoor Family weekend last June; camping gear for the weekend is supplied by the program. Fast-forward a few months and here I am, heading toward Inks Lake State Park in June with a blanket, a pillow and some food — all that the program requires participants to bring. My confidence wavers for a moment as I worry that I’ve bitten off more than I can chew. What if my trip’s a disaster? Thoughts of collapsing tents and scorched campfire food fill my head. My friend Nicole and I check in and introduce ourselves to the other campers beginning to assemble. Families of all sizes and shapes have come from as far as Houston to participate in the workshop. We’re all looking forward to what we’ll learn in the days ahead: pitching a tent, geocaching, starting a fire safely, kayaking and cooking outdoors. All of this for $85. Lorie Hinze and Case Benoit, an aunt/nephew duo from Austin, tell me they saw the workshop on the TPWD website and knew it would be a good fit for them. Lorie says she wanted to take Case, age 8, on a trip that would engage him and keep his attention. He already loves geocaching, so it wasn’t hard to convince him. Of course, everyone’s a first-timer there, or a not-in-a-long-timer. Some aren’t even that familiar with Texas. The Toyoda family moved to Houston from Japan a year ago. They brought their two kids to the Inks Lake weekend. The lead ranger, Lindsay Carter, summons us together and introduces the volunteers who will help throughout the weekend. We introduce ourselves and tell our new friends what motivated us to attend. One dad says he loved to camp as a child and wanted to share that with his kids. A mother admits that this is her third workshop. With no family living nearby, she says the workshops give her daughter an opportunity to play outdoors with other children. When the program launched in 2009 with Holmes’ help, no one really knew what would come of it or how successful it would be. After six years, there is no doubt that this popular program is a hit. Workshops are offered roughly 36 weekends a year and have touched the lives of more than 4,000 families. Participation has nearly tripled since 2009, and the rate isn’t projected to slow anytime soon. Texas’ program has become a national model. 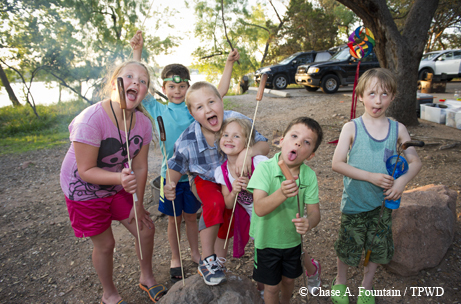 Park systems from 17 states, including Oregon, Colorado and New York, have followed Texas’ lead in creating family camping programs. At Inks Lake, after all the campers introduce themselves, we tackle our most important topic: gear. Participants learn the basics of putting up a tent and setting up camp. Within the big, white trailer emblazoned with the Texas Outdoor Family logo is everything we need. Each family is assigned a tub and an REI tent. The tub contains pots and pans, a propane stove with fuel, cooking utensils, washtubs for dishes, a lantern and a rubber hammer to stake down the tent. The kids head off on a Junior Ranger hike while the grown-ups learn how to set up the campsite. The rangers have cots and sleeping pads for us, so we set up our tents and make a cozy, comfortable home inside. Case returns from the hike happy and bubbling over with new information. He looks at our handiwork with an ear-to-ear grin. “I’m excited to sleep in a tent for the first time!” he says with obvious delight. Listening to recorded animal sounds, we match the chirps and croaks to the photos projected on the trailer. Although it seems as though it is just fun and games, the owls, toads, insects and raccoons we’re identifying are the very animals we may encounter this weekend. Before we hit the cots and bedrolls, we need to do one more important nighttime task: protect our food from the hungry raccoons! The rangers show us a photo of a box of aluminum foil with a mangled image of an ear of corn inside. During an earlier workshop, a family left the box of foil on their picnic table, and when a raccoon visited them one night, he ate the photo of the corn, thinking it was real. Since no ravaging raccoons disturb us during the night, we sleep soundly and get up bright and early for a quick breakfast and some geocaching. Geocaching leads campers to hidden treasure in the park. 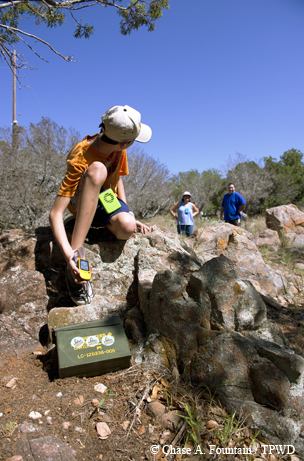 We learn that there’s a geocaching contest in state parks, called the Texas State Parks Geocache Challenge. More than 90 parks, historic sites and natural areas have caches to be found and collected. The more caches you find, the more prizes you win. After our campsite practice, we venture out farther on the hunt. We select the specific geocache to hunt, and a red arrow pops on the screen and leads us to within 10 feet of the cache. We scan the area to find the treasure hidden in plain sight. What fun! We find five more and head back for lunch. The weather is gorgeous, so we spend the afternoon kayaking and fishing on the shimmering lake. Most of us had never kayaked before, so the rangers show us the proper way to deploy the kayak into the water, steer and keep from capsizing. I’ve never felt so free on the water, and so quiet. Some campers decide to try fishing off of the pier near our campsite. No whoppers caught on this trip, but from the whooping and laughing we could hear, no one really cared. Our day ends at the cove, a few feet from the doorway of our tent. While the kids joyfully splash and play in the shallow water, their parents sit back and enjoy the sunset over the lake. We creep back in our tents, a little sad to see the day end, but happily exhausted. Day Three starts with a sunrise on the lake, a little breakfast and a few lessons on how to “Leave No Trace.” The idea is to leave the park not only as it was when we arrived, but in even better condition. So we roll up our tent, return our gear to the trailer, pick up every scrap of trash and pack our cars. Before we leave, though, we have our Texas Outdoor Family graduation ceremony. Each family is called by name and given a graduation certificate and a tote bag of TPWD goodies. 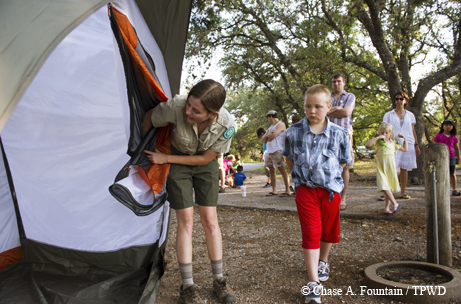 The main goal of Texas Outdoor Family is to connect families to nature by providing enjoyable camping experiences at state parks, and this weekend proves it is doing just that. Research shows that families who have gone through the workshop double their confidence level in camping and also value state parks much more. Nearly 74 percent of families return for day trips, and about 50 percent of families return for overnight trips. Ayumi says their children were excited about the activities they took part in during the weekend. “They loved geocaching,” she says. “They learned how to use the GPS and were excited to find lots of great prizes.” Little daughter Noe smiles shyly and nods her head in agreement. While packing up the car with his aunt Lorie, Case tells me his impressions of the weekend. We thank the rangers, say goodbye to our new friends and head back home, ready to plan our next camping trip. 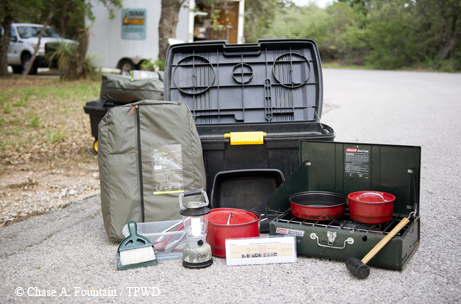 Equipment: In the fall of 2014, the Texas Outdoor Family program updated its equipment. Future campers will be using new REI tents and cots during their weekend trips. The program is also gradually changing its entire fleet of stoves over to propane, making camping basics easier than ever. Locations: The TOF program has expanded to Franklin Mountains State Park in El Paso. Gear has been stationed at the park to allow for more camping workshops in the future. Several other parks, including Brazos Bend, Galveston Island and Stephen F. Austin, have local support groups trained and ready, so gear has been stationed there as well. Bilingual: Bilingual TOF workshops are a new addition at some state parks. Leadership: TOF has implemented a Master Outdoor Leadership Training course, a weekend session to learn about curriculum and best practices for leading outdoor adventures in parks. This program has been offered in Houston. but will be expanding to the Dallas-Fort Worth area and Austin this spring. All TOF information can be found at texasstateparks.org/tof.